On Saturday April 13th the Holy Redeemer Credit Union invited the public to view a housing development called the Eagle Gem Estate that the financial institution was undertaking and offering to its member owners to become home owners in an affordable process. The event started 10 am and lasted until 4 pm that day. 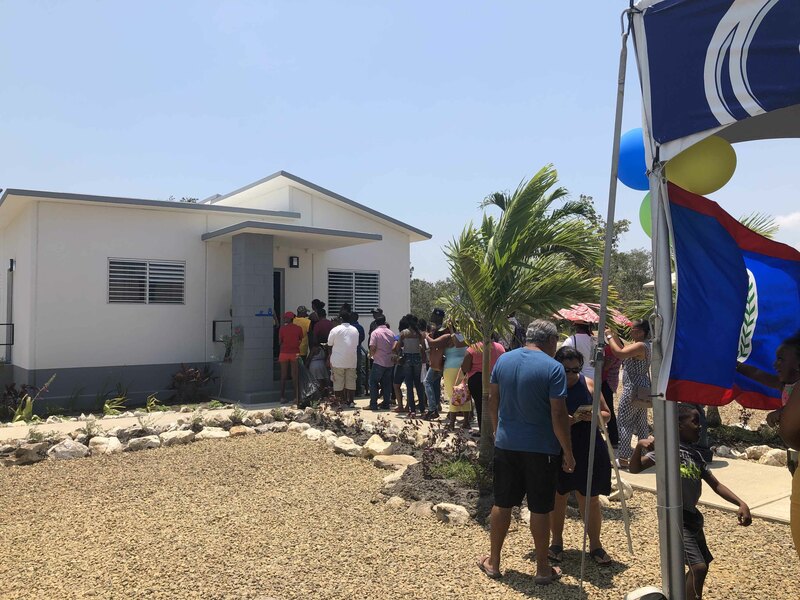 The event attracted huge crowds numbering well above a 1000 who wanted the see the unveiling of a 3-bed room concrete house with all the bells and whistles of a modern-day home as well as a 2-bedroom model. The crowd were given brochures by the friendly staff of the HRCU who then guided the crowd in groups to see both the 3 bed rooms and 2 bed room models while the main crowd waited under tents. The heat did not stop the crowd from coming out to see the development and members/visitors seemed excited to be a part of the event. There was so much excitement and rush that individuals left their turn in lines and headed out to view the unfinished houses just to see how the interior structure of the house were. The from the exterior the houses were stylish standing out from the regular box design but at the same time being well built using a reinforced concrete roofing. Appearing strong enough to withstand strong winds and moderate flooding being a couple feet of the ground. The interior of the house featured a high ceiling which kept the entire house cool even under the Easter heat that Belize usually experiences. It featured a decently size living/dining room for 3 bed room model with a small kitchen, the size of the bedrooms were very large as well as the bathroom. As for the 2-bedroom model, the kitchen appeared slightly larger but still had the best features of the 3-bedroom model as well. Overall the houses appear to well-built and situated on a 104 x 104 feet lot and the additional surrounding infrastructure featured fully paved streets. While additional works were being prepared, it should be noted that the quality of the streets were exceptionally high, exceeding those of the city and nearby towns. The project development phase is initially 67 houses and the holy redeemer credit union is the first of its kind being a private institution that is pioneering an affordable housing market while building reliable houses. Giving the member owners a chance of owning a home at reasonable rate. There are plans for future developments something welcome in Belize since there hasn’t been no public housing developments for many years. When fully implemented the HRCU will be the leader in the affordable housing market since there is currently a void in Belize for that market and possibly causing other financial institutions to follow suit.